1. God has deep thoughts about who you are and has things in store for you that are so awesome you cannot even fathom them, as 1 Corinthians 2:8–9 says: “None of the rulers of this age understood it, for if they had, they would not have crucified the Lord of glory. However, as it is written: ‘What no eye has seen, what no ear has heard, and what no human mind has conceived’—the things God has prepared for those who love him” (niv). 2. God wants to give you more than you can hope for or imagine, as we read in Ephesians 3:20–21: “God can do anything, you know—far more than you could ever imagine or guess or request in your wildest dreams!” (The Message). Before God created each one of us, He handcrafted our lives, our destinies, our callings, our personalities, and our passions. He built into you everything you would need to partner with Him to see His fullness manifest in your life. And oh what a fullness He has for you! Developing a life in God that is conducive to being a dreamer is something you have to pursue and grow in. It is not always natural to our human senses because it requires our relationship with God to bear fruit. So many challenges come up when living this kind of life of faith, so it is more of an earned virtue. I love what Bill Johnson, pastor of Bethel Church in Redding, California, often says: “The Holy Spirit is limited by unbelieving believers.” This is so true! We have to grow in our connection to the heart, mind, and thoughts of God through both the Word and His Spirit so we can start believing for His dream! I remember having an encounter with God in 1996 that caused me to begin dreaming about His heart for the entertainment industry and for Los Angeles. This escalated into a twenty-year spiritual and prophetic journey that in 2006 brought me to LA, where I eventually planted a ministry for creatives and worked with Christians in Hollywood. Now, more than ten years later, it just keeps getting better! This dream required taking great risks. My family and the ministry I was involved in had no heart for Hollywood, let alone Los Angeles. They even had some bad eschatology toward Southern California. 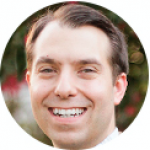 I was not only resisted along the way, I was tempted to lose faith, and I often lost sight of the goal of loving people in the culture capital of the world because my day-to-day life was so different then. The journey was filled with bumps, and the dream became exhausting at times. But in the pursuit of the dream, my faith was refined and my identity was solidified. Dreaming with God does that—it causes our faith to be formed and our identity to be galvanized. The challenges that come along the way are make-it-or-break-it types of events. But when you are living in intimate relationship with a loving God, you actually get strengthened by every challenge. Sometimes dreaming with God even creates contradictions in your current life and self-perception when there are gaps between where you are and where you are called to be. But these contradictions put you on a crash course for dynamic change and challenge you to reach out for more of Jesus so He can form you and your future. To dream wild, you have to actually pursue this change and the tools that will catapult you forward. I wish I’d had this book twenty years ago, but I am glad to be holding it now. I have learned that I need tools to go after the faith lifestyle of a dreamer. Most of the time no one will fully dream your dreams with you except Christ in you. That means it’s going to take the work of faith, the lifestyle of risk, and the biggest thing: learning to keep your heart open and healthy at all times. This book is filled with insights that will help you do just that. 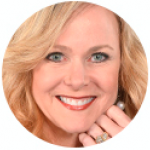 Jennifer has created an incredible resource for you. I am literally using it now with my wife to believe for upgraded dreams and to shed off some old patterns and unbelief. I think this book works so well because Jennifer shares vulnerably about her life and what she experienced before her dreams were fulfilled. She touches on the theological points from a very personal perspective. She takes you on a discipleship journey that is in bite-size but very meaty pieces. When applied, this tool will cause you to make different choices because you will be tying your whole value and identity to Jesus. You will release wrong thinking and bad beliefs or fears. You will allow yourself to dream with God, and I am convinced you will come out on the other end, standing in the middle of dreams fulfilled. The change will be so dramatic, you won’t even recognize your life, nor will longtime friends and family, because it will be more amazing than anything you could have built on your own. This is a CD of prophetic words, sounds and deceesthe defy impossibilites. This is Jennifer prophying words of the Lord against music that will help you remember the words! 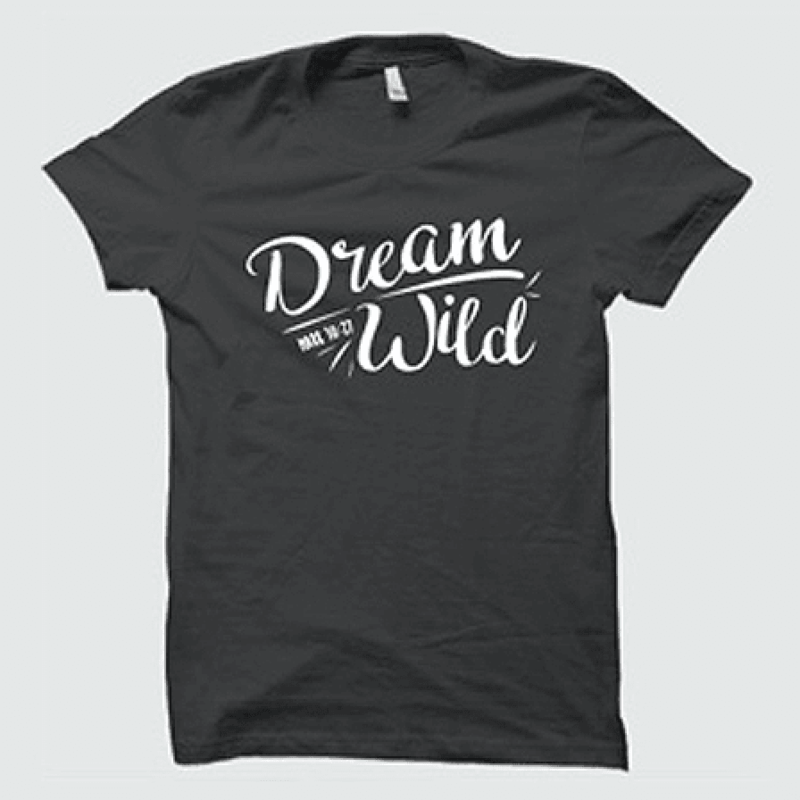 Inspired by Jennifer’s Dream Wild revelation, this T-shirt will remind you to take the limits off God. You can also pickup the CD, Dream Wild with prophetic words, songs and decrees that defy impossibilities. Make a prophetic statement by binding the key to unlocking your wildest dreams around your neck. 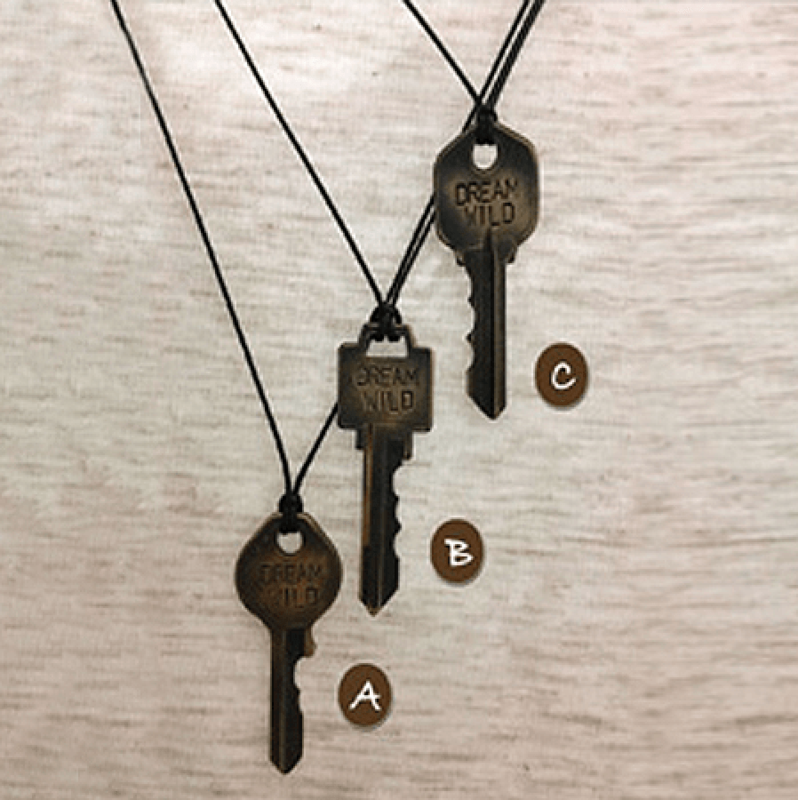 Choose from three styles of DREAM WILD keys with your order. Left to right, choose A, B or C.
In today’s world of moral challenge, financial crisis, and spiritual struggle many believers have lost the ability to dream big dreams. Dreaming big is essential to stepping into the supernatural realm and seeing impossible things made possible to see our world transformed as Jesus commanded. 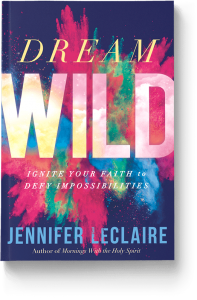 In Dream Wild Jennifer LeClaire targets and destroys every mind-set of limitation, and inspires us to work with God to see our wildest dreams come true and our highest prophetic purpose fulfilled. Get ready to step into an explosion of possibilities! This is not a book on interpreting your dreams or visions. 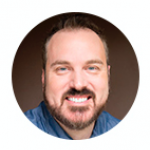 Many Christians can now operate in the dream interpretation grace with ease, and for that I’m grateful. When it comes to actually dreaming God-sized dreams, however, many Christ-followers are intimidated. I’m convinced that many people dream short of what’s possible because they settle for vision that can be accomplished through human strength and ingenuity. We dream comfortable dreams because we are confident that we can accomplish them through our own resources and resolve. But there’s nothing risky about that. There’s nothing wild about dreaming what you can fulfill through your own ability. We’re okay with dreams that don’t scare us. 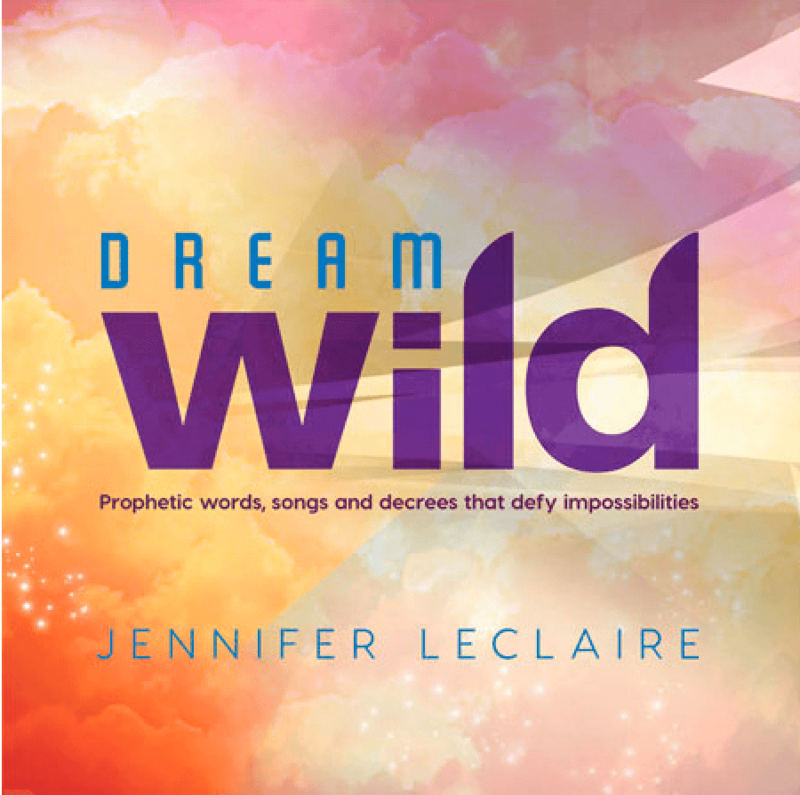 But Dream Wild is a prophetic call to dream beyond yourself—dream beyond whatever you could “hope, dream or imagine” and actually tap into the kinds of dreams that can only come to fruition through the supernatural power of God. Jennifer is a prolific author. She is also a good friend and trusted prophetic voice. I’m excited about this gift she is presenting to the body of Christ. It’s not simply written as “another book.” Chapter after chapter, entry after entry, you are receiving powerful prophetic words from the Lord laced throughout. One of my favorites comes early on in the manuscript. Jennifer writes, “I’d rather dream wild dreams and get half of what I am dreaming for than dream small dreams and get all of what I am dreaming for.” Amen! 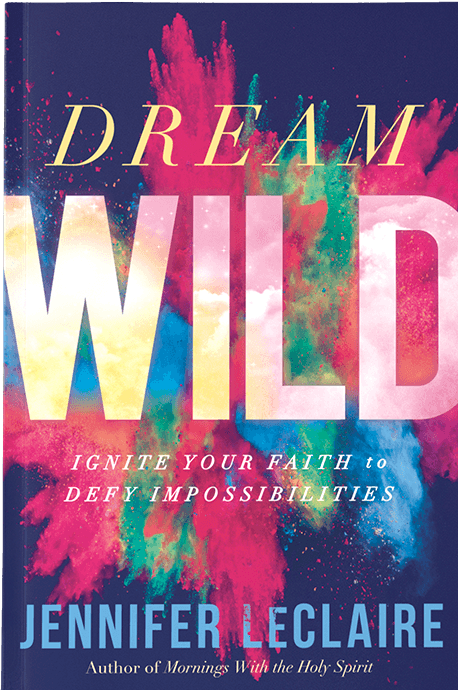 Dream Wild gives you permission to take the lid off of what’s possible with God. The only ceiling under an open Heaven is the one we build there through our own limited thinking. 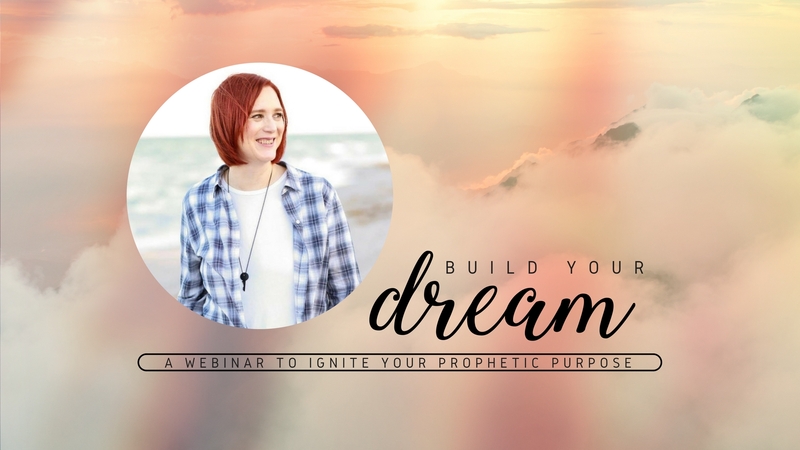 Through a very methodical, easy-to-read process, Jennifer takes you through the process of having faith, releasing the Word of the Lord over your dreams, drawing inspiration from testimonies of other wild dreamers (I love that! ), moving past failure, making healthy alignments, dealing with doubt, and ultimately taking all the limitations off what God can do. Jennifer LeClaire’s new book provokes you to see impossibilities as logical. It makes absolute sense for believers, filled with the Spirit of God—the Spirit who created all things—to dream impossible dreams. Receive Dream Wild as your personal prophetic permission slip to imagine the impossible and cooperate with God Almighty to see what’s in Heaven released into the Earth through your imagination, creativity, and wild dreams!